A large and beautiful 1750 map of Japan and Korea by Robert de Vaugondy. Centered on the Bay of Osaka, this map covers from eastern Korea and Ngan-Hai Island eastward to include all of Tokugawa (edo) era Japan. Hokkaido, here identified as Yedso, is inaccurately and embryonically rendered off the northern tip of Honshu. Various towns, provinces, and daimyo are noted in both Japan and Korea. The sea between Japan and Korea, whose name, either the 'Sea of Korea' 'east Sea,' or the 'Sea of Japan,' is currently a matter of historical and political dispute between the countries is here identified in favor of both countries, with both 'Mer de Coree' and 'Mer du Japon' applied to the same sea. This map was issued in 1750 by Robert de Vaugondy for the 1750 first edition of the Atlas Universel. Vaugondy, R. , Atlas Universel (Paris) 1750. Very good. Original centerfold. Blank on verso. Original platemark visible. Lower margin narrow. Rumsey 3353.095. Pedley, M.S., Bel et Utile: The Work of the Robert de Vaugondy Family of Mapmakers, page 201, #410, illus. p.15. Walter, L., Japan: A Cartographic Vision: European Printed Maps from the early 16th to the 19th Century, #86. 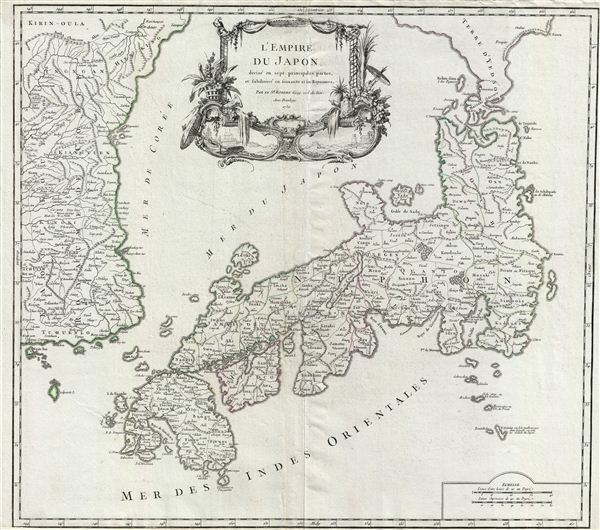 Campbell, T., Japan: European Printed Maps to 1800, (London: Map Collectors' Circle) #65. OAG-100. Cortazzi, H., Isles of Gold: Antique Maps of Japan, p. 50.